Assemblyman Kevin Byrne (Brewster), sponsor of A8914 which concerns the re-naming of the former Tappan Zee Bridge, amended the bill on April 25 to match Senate Bill 7671, sponsored by Senator John DeFrancisco (Syracuse). The matching bills are now able to move forward and have been referred to their respective Transportation Committees. The Assembly version has eight co-sponsors. The bridge, which provides passage over the Hudson River between Westchester and Rockland counties, was rebuilt in 2017 and re-named The Mario M. Cuomo Bridge after a provision for such was included in Gov. Andrew Cuomo’s budget. 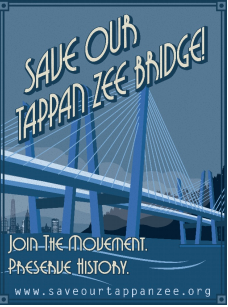 Dr. Monroe Mann, founder of Save Our Tappan Zee, Inc., an organization dedicated to returning the Tappan Zee name to the bridge, claims that representatives have been hearing from angry residents ever since the name change was announced. His petition on Change.org has to date gathered 108,300 signatures. The office of Sen. Joseph Robach, chair of the Senate’s Transportation Committee, expects the Senate version of the bill to successfully move out of Transportation by the end of this month. Both bills would restore the Tappan Zee name by settling on a compromise name: The Mario M. Cuomo/Tappan Zee Bridge. Existing bridge signs would not be changed.